Where do Tapas Come From? Tapas are small, savory dishes that originated in Spain. They can be served on small plates as snacks, appetizers, mini-sandwich canapés, or a small serving dish that comes with a beverage. In Spain, lunch is typically served from 1 to 3 pm, and the dinner menu isn’t available until after 8:00 pm. If you want to eat between this time frame, that generally means buying tapas. Sometimes smaller restaurants will give you a tapa on the side for free when you order a drink, similar to getting peanuts at a bar in the US. There are a variety of stories as to the origin of tapas. One of these stories claims that during the middle of the 19th century, while on a trip in southern Spain near Cadiz, King Alfonso stopped to rest in a town and ordered a glass of sherry. It was windy, so the innkeeper served his sherry covered by a slice of ham to prevent the sherry from getting dirt in the glass. King Alfonso liked the idea so much, that when he asked for a second glass, he requested another tapa (which means lid or cover), just like the first beverage. If you go to the Basque Country in northern Spain, these same dishes are called Pintxos, and the Basques claim that they were the first to serve these small snack dishes. Tapas vary tremendously by region and even from village to village. You’ll see everything from a small bowl of olives on a toothpick, to grilled shrimp, roasted vegetables, a small piece of tuna, grilled sardines, a thin slice of roasted beef, and even a skewer with pickled vegetables. Too often for my taste, tapas also include a variety of canapé sandwiches, featuring two, three, and sometimes even four layers of bread. In the US, instead of ordering tapas for a snack, and then going to dinner later, we often order a variety of tapas together and call that dinner. When ordering tapas in a restaurant, I always recommend ordering a variety of vegetable options to go with more traditional protein choices; some of my favorite veggie options are the roasted vegetables, sautéed peppers, and wild mushroom tapas. Over the next month, I’ll share several individual tapa recipes. Combined together, you could host your own tapas party. Below is a recipe to get you started! Padron chilies were served as appetizer (tapa) dishes throughout restaurants in Spain, and we started buying them in the market as well. Most of these chilies are sweet, although occasionally you’ll find some moderately spicy chilies in the bunch. 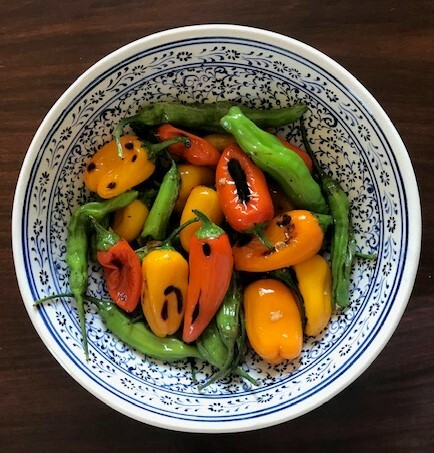 In the US, we don’t find classic Padron chilies often, but you could make this tapa dish with either shishito peppers (they are a bit spicy), or use baby bell peppers. Heat a sauté pan or skillet to medium-high heat, add chilies, cover, and sauté for 3-4 minutes, stirring occasionally until chilies start to lightly brown. Reduce heat to medium-low, add olive oil, salt, and garlic, and heat 2 more minutes, stirring intermittently. I too loved the Spanish Tapas. So I look forward to your recipes.